Outdoor Management Development Programme -(OMDP) are Training programmes that follows the methodology of Outbound Training, Adventure and Experiential learning to facilitate Management Development Practices. 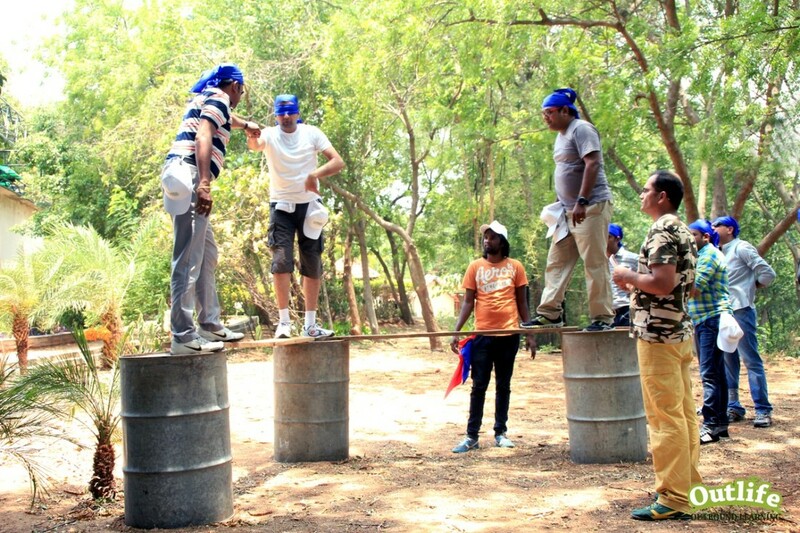 The Outdoor Management Development Training focuses on applying the principles of management through experiential learning, and motivating participants to experience, reflect and learn crucial lessons that can be applied back at the workplace in areas of self management, people management, leadership and organisational development. People learn every time they are confronted with an unusual problem, an unfamiliar task, they then have to evolve new ways of dealing with the situation. ​They will learn if they analyse what they did to determine how and why it contributed to its success or failure. The facilitators observes the behavior patterns and invites the participants towards change through debriefing and usage of metaphors. If managers are to effectively lead their organizations, they must first effectively lead themselves. Managers today are expected not only effectively manage teams but also manage themselves with authenticity when it comes to communication, prioritizing goals, decision making, handling conflict and be self accountable. The Self-management aspect of the training helps the participants to become more self aware on all the physical, emotional, mental, social and spiritual aspects of self management. Many times managers meet only at important corporate events. Otherwise they are into their own functional activities. But there should be mutual understanding of others function in order to take decision as one company. In order to create common understanding at organizational level and create a strong corporate team, outdoor management development activities are conducted to enhance team building among managers..
Good people management is one of the key contributions that a manager makes to an organisation’s productivity, culture, staff retention and attractiveness to potential employees. Good people management is also one of the key factors contributing to a manager’s success (and excellence) in their role. This development area is one of many that centre on a manager’s ability to work with people. Here the focus is on the fundamental actions and activities that a manager undertakes to enable their staff to perform that ecompasses developing and maintaining procedures, systems, projects, processes, programmes and/or services through the leadership and management of people. As organization tries to build team of leadership, people coming from different functions who are top performers, comprises leadership team. ​When people come from different function, they may not be prepared enough to take role of leader at organizational level. In order to develop organizational understanding and Leadership Development , outdoor management development programs that are usually residential are conducted to bridge the gaps in leadership and organisational development. 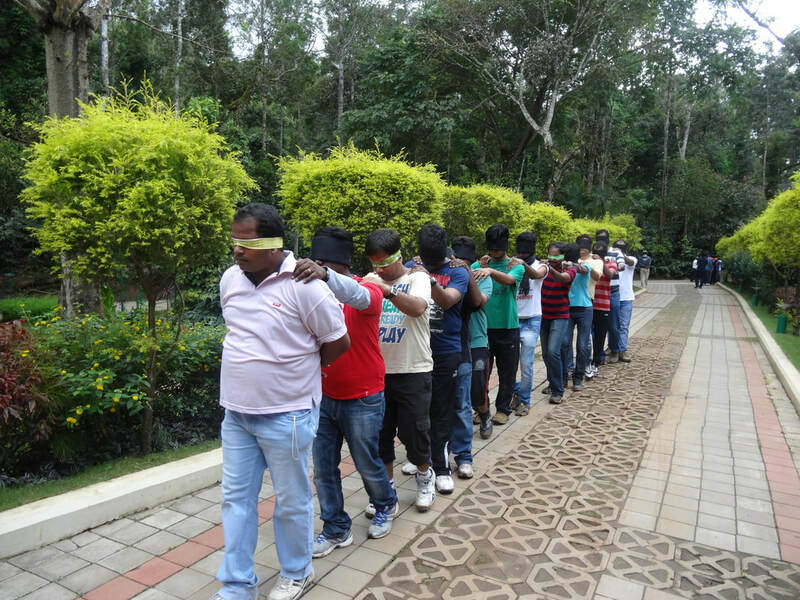 Outdoor Management Development Training programs are designed on experiential learning simulations to improve aspects of strategic leadership, communication skills, planning, change management, delegation and teamwork. The Activities for outdoor management development training take place in real time, there is no ambiguity about success and failure, and the participants receive immediate feedback about the efficacy of their actions. ​The many distracting and extraneous aspects of the workplace are eliminated by the creation of a carefully designed metaphors which involves and empowers the learner to relate and connect back to the workplace situations and transfer the learning from the experience to application or change back at the workplace. Outlife Offers the following program in Management Development Training based on Job Functions and Key Responsibility Areas. Senior and Executive management Training focuses on key responsibility areas of visioning, focus, big picture and strategy thinking for overseeing the entire organization. Middle-level managers training focuses on key responsibility areas of leadership, planning, problem solving, performance management for executing organizational plans which comply with the company’s goals and strategy. 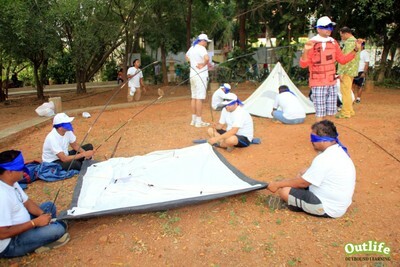 Participants are divided into teams and assigned tasks or activities for completion in a specified time. Achievement and performance during these activities is reviewed during debriefing or processing of the experiences. ​Group, Interpersonal and intra-personal behaviors that can enhance performance or lead to failure or decreased performance are identified. Newer Strategies and management concepts are formulated and adopted to implement back at the workplace. Everyone involved in the learning simulations has to negotiate new situations and respond to challenges with which they are unfamiliar. Teamwork and co-operation are fostered through activities that cannot be successfully accomplished without a high level of communication and working together. In addition, at the same time participants listen to the experiences of others and realize that people learn different things from performing the same activities. In the end, the reflections on the differences in perceptions and emotions that are elicited via the games are extremely valuable. The power of outdoor management development facilitation is in using the environment to create a metaphor for business applications. feelings, and try new solutions to real problems (outdoor activities), and use these decision making skills in other (equally real) situations back in the real business environment. Our Outdoor Management Development Programs takes customized approach to its design and is based on the learning objectives and desired outcomes of the specific organisation, industry, team and participants. The initial flow however starts with Ice breakers, Energizers, Trust Building Activities, Behavioral Contract, Ways of Working. Later Experiential Learning Activities and Simulations are introduced followed by Sharing and debriefing. Psychometric tests focusing on the individual or teams is often part of the program. We specialize in custom designing management development programs for our clients after a through needs assessment. Below are some of the management development programs conducted in the recent days. 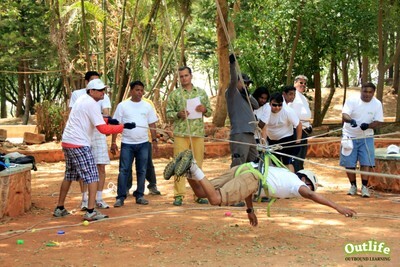 The Activities in the management development programs include a mix of outdoor and indoor actvities that include adventure, outdoors, team games, management games, group discussion, role plays, theater, psychometric instruments and case studies that are focused on bringing out leadership and management experiences and that are followed by debriefing and transference. 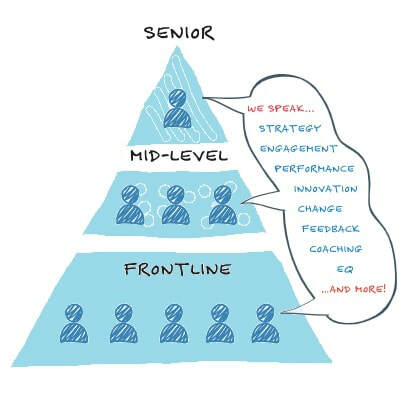 Management Development Programs are usually high impact and end up on a high note. Coaching and Mentoring becomes essential post the program to help the managers implement the learning and strategies back to the workplace and deal with any setbacks, challenges and obstacles. ​Our facilitators offers periodic mentoring and coaching after the program to help the participants implement the learning and strategies effectively. The Management Development Programs are specially facilitated by senior facilitators with 2 decades of industry experience in a senior management or executive management role and having over a decade of experience in Organisation Development, Training and Facilitation.